Isaiah 1-6, phew, that’s a lot to take in. Highlights include the old favourites; “they shall beat their swords into to ploughshares” (2:4); “Here am I; send me!” (6:8) and of course the Sunday morning favourite “Holy, holy, holy is the Lord of hosts: the whole earth is full of his glory.” Each of these verses deserves a treatise of its own, each of them have blessed and will bless me and you and us. But to cherry-pick these 21st century friendly (if any Bible verse can be called such) lines would really not reflect the ambience of the chapters as a whole, would it? The truth is that I find it hard not to make jokes about verses like that. I feel compelled to somehow defuse my middle-class, western, liberal (oooh I hate that word!) discomfort with these verses of desolation. 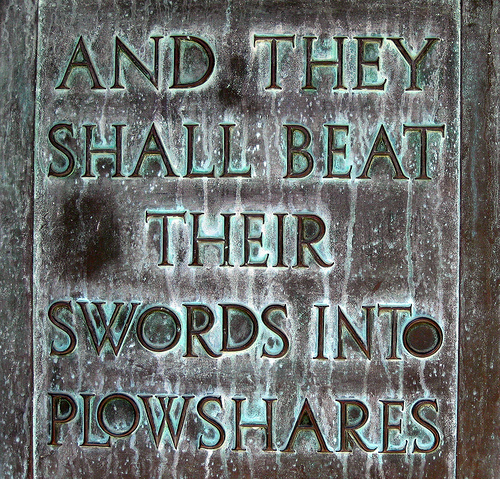 So I’ll write “swords into ploughshares” in nice writing and put it up somewhere and forget the slightly threatening tones of the song of the unfruitful vineyard (5:1-7). This is heart-breakingly apparent in the song of the unfruitful vineyard when the gardener asks “What more was there to do for my vineyard that I haven’t done?” The voice of God, like a forlorn parent regarding their misguided progeny. It’s been almost 3000 years but still the alarming revelation that blessing, security and even salvation don’t guarantee a faithful heart, or a people dedicated to compassion. See also the Conservative party front bench (oh no she didn’t!). But I am pleasantly surprised to be reminded that the first 5 chapters of Joshua contain no actual killing. Sure, there are more than a few hints that a lot of killing is about to take place; armed warriors are to cross the Jordan first, spies are sent to Jericho, Rahab tells them that “all the inhabitants of the land melt before you.” But the beginning of the Israelites’ return to the promise land has the power of God and the importance of God’ law at its centre. Throughout the Old Testament we are reminded of the Exodus story and here is no different. God brings the Israelites across the Jordan by stopping its flow, just like in the Exodus. Then in Chapter 5 all those born in the time in the wilderness (which is everyone, all the previous generation have died) are circumcised. This is followed by an account of the celebration of the passover and Israel’s first meal of the “produce of the land”, which must have tasted pretty sweet after all that manna. And finally we are told of an encounter between Joshua and “the commander of the army of Lord”. This chapter, which is directly followed by the fall of Jericho, ends with the command “remove the sandals from you feet, for the place where you stand in holy.” Very Moses and the burning bush; don’t you think? There are many mysterious and inspiring passages in these early chapters of Joshua, but I must admit I can’t help finding them tainted them by the anticipation of what is to come…”holy war”. Yet if I put that aside this time – I fear it won’t be so easy next Wednesday – I see that this is the home-coming of the Israelites. The climax of exile. A return to where they are willed to be by God. And every chapter revere’s God’s power to do this, through the narrative voice and the voices of Joshua, Rahab and God Himself. And from that came sky and light and tree and birds. Even “great sea monsters monsters” get a mention. And finally, but never finally, us. “Let us make humankind in our own image…male and female he created them”. These first 34 verses are so profound, so potent with meaning and significance that I have few words. I’m sure I’m seeing them as is a dark mirror dimly. They effect me very much like John 1 does. There a rhythm to these words that seeps truth into your pores. Read it, read it now! It tells us of a God who brings light from darkness, fertility from barreness and who gives us the gift and responsibility of his creation. I didn’t know until recently that many scholars agree that this and Genesis 2:4-3:24 are two different accounts of creation, but it makes sense to me. It’s feels awkward to fit these two together. Creation has a different order and the depictions of God really contrast . In the first story God is he but seems more mysterious and formless than God in the Garden of Eden, who talks with Adam and strolls through his creation. I’m not saying these are different Gods, not at all, but different aspects definitely. And it’s nice to have them side by side, as if one of the first messages of the Hebrew scriptures is a pluralilty of experience and understanding; something I feel the Church could do with embracing more and more. The story of Eden is one we all know, or we think we know. There is no apple, Eve is no whily minx (she isn’t even called Eve yet, just woman). It is certainly one we recognise. Wanting the one thing we can’t have; knowledge not always being a blessing; shame that drives us away from God. But I suppose what I want to say today is don’t forget the first chapter of Genesis, or see it as a prologue to Eden. Genesis 1 tells us we were made in the image of God. That’s really important. I don’t think it matters if you don’t take the six days literally, I don’t think that’s the point. The point is that we are part of God’s creation, which he called good “indeed, it was very good”. There is prevelant theology that we are inherently wicked, which some verses of scripture, especially from the psalms, seem to back up. That idea that our innate nature being displeasing to God always troubled me. Indeed, the week before I was baptised I broke down into floods of tears at my house group because that very thing was being discussed and I was worried that I shouldn’t get baptised in a church that held this idea as true. Needless to say everyone was very loving about it and I took the plunge that Sunday. It is nice for me, then, that here in Genesis 1 I find an ally. God created us in his image and called us good; could we really be capable of changing the very nature of God’s creation? We can forget it, corrupt it, we can live in a state of sin that separates us from it, absolutely – that’s what I think the Eden story is about to a large extent – but change it? Change God’s creation inherently? There’s nothing about that in chapter 3. Toil and conflict? Sure? A state of irrevocable wickedness? Not so much.